One of the things I like about Scouting is how the entire program from Tigers (or Lions now) to Eagles gradually provides age-appropriate opportunities for growth in the areas of character, citizenship, and fitness. One of the many tightropes a scout volunteer leader, such as den leader, cubmaster, and scoutmaster, needs to walk is balancing the appropriateness of activities and tasks. For example, camping at the Cub Scout level happens in frontcountry settings and includes a parent or guardian for each scout while Boy Scouts have just a couple leaders and can explore into the wilderness as scout skills progress. Earlier experiences are small and manageable, and lay a foundation for more challenging later adventures. Leadership is a core part of the scouting experience and all scouts should be offered opportunity to lead at all levels of scouting. The Denner role is a wonderful means by which individual scouts experience small doses of leadership, and the power, responsibility, and frustration that can come from it. Every den should use the Denner position. The denner is a den member that has been selected to the position for a short time. This is usually a month or two so he can participate in this role multiple times. It's important that the den participate in the choosing of the denner, but selections can be handled different ways based on the age of scouts. Tiger and Wolf scouts may choose which scout will be the denner to fill a list of months. Bears may elect the next denner with a show of hands. Webelos could have a secret ballot election. If the den leader just assigns the job, it takes ownership away from the scouts. To ensure all scouts get a time as denner, den leaders should stipulate that no scout can be selected twice until all scouts have been denner once. The denner wears the gold double-cord denner braid looped over his left shoulder while in the position. Many dens pass this braid on to the next denner. 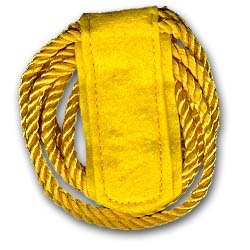 Past denners sometimes keep the gold tab portion to wear on their blue Cub Scout uniform to signify they have been a denner. The denner duties are defined by the den leader. They should be appropriate for the age of the den and should be supplemental to the duties of the den chief, if one is used. The den chief and denner may work closely together which makes both jobs more rewarding. Plan to arrive 10 minutes early to den meetings and stay 10 minutes after to help set up and clean up. Welcome scouts to the meeting. Call den meeting to order using the sign. Lead the den in a n opening ceremony. Help den leader with passing out supplies. Prepare a joke or story to tell. Prepare a game to play. Help den leader keep order as asked. Asking a Tiger scout to do all these things is probably too much. As scouts become accustomed to doing small bits of leading, more responsibility is given to them. By the time a scout has advanced to Webelos rank, he may take on even more leadership such as leading ceremonies and organizing a den hike. By using the denner role, a den leader helps prepare scouts for Boy Scout positions of responsibility, such as Patrol Leader and Senior Patrol Leader. Both of these positions build on the rsponsibility of leadership they were introduced to in Cub Scouts. Thanks for your posting. I think a denner is a great idea. The dens in our pack wear class B uniforms during den meetings. Any suggestions to indicate denners besides gold cord? I'm going to have Denners and Assistant Denners in my Wolf den. Since we have only two returning Scouts, they'll be the first ones; each month, the Assistant Denner will advance to Denner, and the boys will choose a new Assistant Denner. I will give each "retiring" Denner a gold shoulder tab to show his service. Here's my question: how long can a former Denner wear the shoulder tab? Can he keep wearing it throughout his Cub Scouring career, or does it need to come off when he advances (in this case, to Bear)?